Gardener proposed that students learn in many different ways. He stated that there are eight different “frames of mind” in which students may be exceptionally intelligent or gifted. 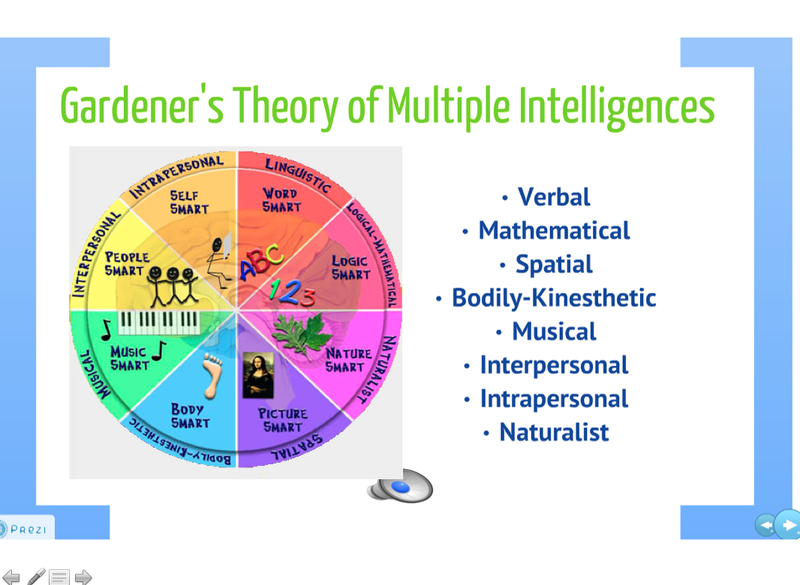 Gardner states that individuals learn best when they apply their strongest form of intelligence. The first form of intelligence is verbal intelligence. Those who posses this type of intelligence are gifted in regards to communication. These individuals can use language effectively to express meaning as well as think in words. Those with a mathematical intelligence have the capability of understanding and performing various mathematical operations. Spatial intelligence refers to individuals who are able to think three-dimensionally. They are able to plan different structures and arrangements in their minds. Bodily-kinesthetic intelligence is the ability to manipulate objects and be physically in-tune with oneself. Individuals who posses this type of intelligence are very self-aware and coordinated. An individual who posses a musical intelligence is generally sensitive to pitch, melody, rhythm, and tone. Those with an interpersonal intelligence are able to interact effectively with others. They posses the ability to understand and relate with different types of people. Intrapersonal intelligence refers to an individual who posses a great understanding of oneself. Finally, an individual with a naturalist intelligence is someone who is ale to recognize and understand various patterns and processes that occur in nature. This theory is important to understand because it manifests the idea that not all students learn in the same way. Gardener states that everyone has all of these intelligences, but to varying degrees. Gardener argues that his is why individuals process information in different ways.